This rule is optional. It states that if the last person to bid is the clear leader on the scorepad (not tied) he/she can not bid to make it "even" unless the bid is zero. This means someone must "break". (Unless the dealer bids zero to make it even. )...The rule is particularly important for the last hand of a game. If the leader's bid makes it 'even' the positions are unlikely to change. The rule tends to keep the outcome in doubt when this situation arises. Sorry about that. These are being phased out. Meanwhile I suggest photocopying your own larger pads as it's cheaper than ordering larger pads by mail. Most players simply accept the tie score as final. Other options include: cutting the cards, flipping a coin, the person with the most "made" hands and some play a "show-down" game. This consists of dealing 10 cards to both tied players and bids are made using the "delayed reveal" system, then the hand is played out. Whatever works for you. Players available? The best time to find players appears to be 8 p.m. in the evening E.S.T. but the best day hasnt been established as yet. Week days should be pretty much the same but Sat. & Sun. should be prime time. When the Beta testing is completely finished and all systems are go it will take a while to get the message out to the "Wizard World". Eventually we hope that any time you want to play there will be players available. Patience is a virtue. Players must always wait for their turn to play. What is a Round? One card played from each player�s hand. Example if 4 players: 3 Spades, 8 clubs, 6 Spades, Jack of Spades. What is a Trick and who wins the Trick? A trick is a round of cards played; one card from each player�s hand. Example if 4 players: Same as above (Jack of Spades wins). Another Example: 3 Spades, 8 Clubs, King of Diamonds, Wizard (Wizard wins). What is Trump? Trump is the suit card (spade, heart, club or diamond) at the end of the deal turned face up on the remaining pack of cards. Trump cards win tricks over other suited cards, even higher suited cards. Example: If card turned up after the deal is a spade, all spades are trump cards. Example if 4 players: First player leads 9 of clubs, diamonds, or hearts, and next player(s) do not have a club, they can win trick by trumping with any numbered Spade card (provided no one plays Wizard). What happens if a Wizard is turned up at the end of the deal instead of a suit card? Dealer chooses the Trump suit after looking at his/her cards before bidding starts. What happens if a Jester is turned up at the end of the deal instead of a suit card? The play is No Trump. Must you always follow suit? Yes, players must follow suit, if possible, and the suit is determined by the spade, heart, club or diamond of the first card played in each round. Exception: Even though you have a card of the suit that was led, you have the option of playing a Wizard or a Jester at your turn. What happens if a player cannot follow suit? If a player cannot follow suit, they can play any other suit including Trump. What happens if the first card played in a round is a Wizard? Players may discard any card they wish. What happens if the first card played in a round is a Jester? The suit is determined by the next card played. What happens if the first card played is a suit card, followed by a Wizard? Players must still follow suit, if possible, even though Wizard will win round. What happens if the first card played is a suit card, followed by a Jester? Players must still follow suit, if possible Can Wizards and Jesters be played at any time? Yes, anytime at the player�s turn. Do Wizards always win? Yes, Wizards always win no matter when played during a round. Exception: If more than one Wizard is played in a round, the first Wizard played wins. Do Jesters always lose? Yes, no matter when they are played during a round. Exception: If only Jesters are played in a round, the last Jester played wins the round. Can Wizard Card Game be played by just two players? Yes, but when only two play it is more interesting to conceal the bid until after completion of play. How can players keep track of their bid, and the other players� bids? The deluxe version of Wizard Card Game includes six bidding wheels. Players indicate their bid on the bidding wheel, and they place the bidding wheel in front of them on the table. As an alternate game, players may also prefer to delay revealing their bids. In this case, bidding wheels are placed face down on the table until after completion of play. Can players also use coins? Using coins, players indicate their bid by placing coins in front of them on the table. As a trick is won, they place a coin on the trick. It is easy to see how many coins remain in front of a player and, thus, the number of tricks the player still needs to make. Wizard coins are available through the publisher or your local store. At the end of each Round, do you reshuffle all cards? Yes, the complete deck of 60 cards is reshuffled at the end of each round. How does the scoring work? To win points, you must make your exact bid. You cannot be over or under your bid. If you bid 0, and you make no tricks, that is still considered making your bid. You receive 20 points for making your bid, and an additional 10 points for each trick that you bid and made. Example: If you bid 0, and do not take any tricks, you made your bid and earn 20 points. Example: If you bid 1 trick and only take 1 trick, you made your bid of 1 trick, and you receive 20 points for making the bid, and 10 points for the trick made, total 30 points. Example: If you bid 4 tricks and make either 3 or 5 tricks, you are under or over your bid respectively, and you deduct 10 points for each trick over or under your bid. How do you settle a game that ends in a tie score? The tied players draw one card from the deck to establish the dealer. Ten cards are dealt to each of the tied players for a tie-breaker round of ten tricks. Players do not state their bids aloud but write the bid on a slip of paper which is left face down on the table until the play of the round is completed. What is the Canadian Rule? This rule is optional. It states that should the last person to bid also have the highest score on the score sheet (not tied), he/she cannot bid a number that would equal the number of possible tricks in the round. This might lead to another tie. Exception: The last bidder and leader may bid zero. Reneging If noticed before another card is played, no penalty. If trick is completed and mistake then discovered, everyone automatically makes their bid except for reneger who loses 20 points. Can I download extra score sheets? Go to www.wizardcards.com and hit Download Wizard at top of page. How can I locate a local Wizard tournament? 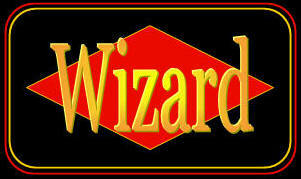 Contact Ken Fisher at: kfisher@bellnet.ca Can Wizard Card Game be played online? Yes, go to www.wizardcards.com , click on REGISTER and follow directions provided What day and time is best to find players online? Usually evenings 8:00 p. m. E.S.T., but the best day(s) has not been established yet. Some players prefer weekdays, others weekends. No. The Wizard wins and players can discard any card including another wizard. No, the trump remains whatever card was turned up. However the card following the Jester determines the suit for that round. i.e., If a heart is played others must follow suit if they can. (Of course they can also play a Wizard or Jester if they so choose.) If the lead of a Jester is immediately followed by a Wizard then the hand is played as if the Wizard was the lead card. This means that the Wizard wins the trick and other players may discard any card that they wish. Go to the "Forums" then "Tournaments" then "Organizing a Local Tournament" for more information. The symbols represent the four basic elements: earth, air, fire and water. In the table-top version 2 can play if the "delayed reveal bid" is used. (See Bidding Variations in the rules) In the online version a 3-handed game must be set up, then 1 player dropped. Again it's better to use the "Hidden Bid" or "Delayed Reveal Bid". Wizard provides "bid indicators" in the "Deluxe Version". They are also useful for playing the 2 other bidding variations described in the rules. Others use coins or chips. Most simply ask the scorekeeper if they're not sure. I understand that a player whose prediction is incorrect loses 10 points for each over or under trick. However, does that player still score 10 points for each trick taken? Or is the player who correctly predicts the number of tricks taken the only one who can also score 10 points for each trick taken? To score 10 points for each trick the player must make his exact bid.